One of the questions we are asked most is “What is the best type of warehouse racking system?” The answer, helpfully, is ‘it depends’! 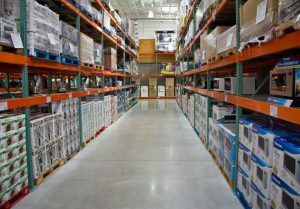 Of course, the warehouse racking that will be best for your situation depends entirely on the type of stock held. Ultimately, having the right warehouse racking system, which works with your stock, can make a massive difference to efficiency and thus your bottom line. The wrong choice can make it harder to access stock and therefore have an impact on overall efficiency. Possibly the best pallet racking for versatility and the most widely used storage system for goods stored on pallets. Selective racking is allows direct access to each pallet from the aisle which is ideal when there are a relatively low number of pallets per SKU. This type of racking generally requires a smaller investment than other types of pallet racking. Double Deep Pallet Racking increases capacity by storing pallets with the same SKU behind each other. This type of storage requires counterbalanced forklift trucks with the option of long reach in order to load and unload the rear pallet. This may also mean the need for wider aisles, which would reduce storage density. However Double Deep Pallet Racking is a cheaper option than Dynamic Push Back Racking (see below) because it does not use the roller system to bring the rear pallet to the front. Dynamic Push Back Pallet Racking is a warehouse storage system designed to maximise warehouse capacity and make loading and unloading as straightforward as possible. Pallets of the same SKU are stored behind each other, with the one behind pushed to the rear when a front one is loaded. When the front pallet is unloaded, the rear pallet comes to the front. Dynamic Push Back Pallet Racking is generally used when FILO stock rotation is appropriate. Pallets are placed on gravity roll tracks and move from the point of entry to the unloading point using gravity and the angle of the racking. Best for FIFO stock rotation and ideal where stock rotates relatively quickly. This type of racking consists of long arms which extend from a framework which is bolted to the floor for stability. Cantilever racking is best used for long items such as piping, timber and carpet where the item rests across multiple arms. Cantilever Racking can either be fixed against a wall or as double-sided racking where product is accessible from both sides. Whereas the systems described above involve racking structures divided by aisles, in Drive In Racking, pallets are stored on a cantilevered structure in blocks and forklift trucks load and unload pallets by driving into the block. Drive In racking is a highly efficient method of warehouse storage which maximises storage and thus reduces ongoing costs. It requires FILO stock rotation.